What is God's meaning of time? What should I do when my prayers seem delayed? 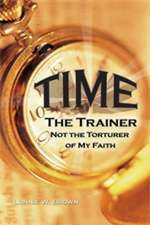 All of these questions and more are answered in Apostle Lonnie W. Brown's latest book, "Time the Trainer, Not the Torture of My Faith." God has given us all a measure of time to use for Kingdom expansion. This book is a must read for those who want to use their time here on Earth to maximize their potential and obey their destiny.